So there has been a lot of complaining about the ESMA regulations, but there are some silver linings. One of the ones I’ve been most looking forward to is the bit detailing how many retail traders make or lose money. This is interesting as there have been quite a few posts asking if anybody actually makes money from trading. The answer is yes. 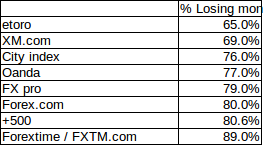 I had a brief look around the different big UK brokers and found between 65% and 90% of traders consistently lose money. I have made a small table to compare a few I have used or have heard about below. It is interesting that the average is 77%, close enough to the 80% Pareto Principle. These figures come from the Brokers own websites and are correct as of August 2018. Feel free to add to the list of brokers, I may update the list as more information comes by. Obviously the idea is to open accounts with the best winning ratios from brokers. The table is listed in percentage of losing accounts, so lower is better. So far eToro appears to be the best platform, followed by XM.com. As a note I am not paid by any brokers and have no interests in them. The information is taken from apparently transparent sources enforced by the new ESMA regulations. LCG (then Capital Spreads) (spreadbetting clients): 78% (2014, I think). Yes, I’ve actually just signed up to it because of the rating. I tried it with a vitual/demo account and I have found it unwieldy and not very user friendly. I think the positive thing about it is being able to invest with other traders. It seems they are very scrupulous about who they allow and this may be the positive factor. If quite a few accounts just follow some consistent and good traders then more people will have positive balances. This is probably why it has such a good result outcome in these results. Personally, as a trading platform it doesn’t suit me. All of these are EU-regulated, as you might guess by the percentage disclosure and have the ESMA leverage caps in effect. Thanks, I’ll add to my list. Thanks, I’ll add to my list and update soon. Hi there, what does TA stand for? Technical Analysis - the use of charts showing past price action of a tradable instrument in order to identify potential times and prices at which to buy or sell the instrument. As opposed to Fundamental Analysis - the use of data concerning the financial performance of the underlying entity for which there is a tradable instrument, e.g. profit and loss figures reported by the entity, a company, which assist in identifying situations in which to buy or sell the instrument, the company’s shares. DO NOT start trading until you have learned and understood how both work and you have a rational trading strategy to guide your buy/sell decisions. There’s a little pop-up at the foot of their home page - 65% of people who trade CFD’s with them lose. But maybe if you’re outside the EU, or if you’re dealing with a subsidiary outside the EU, this won’t show? Now the problem is, even if we acknowledged that the % of losses in etoro is less than the competition, what is the point of having a higher chance of getting a return on capital, if there is no return OF you capital in the first place, i mean i see a lot of posts here that claim they have problems with money withdrawals from etoro, so yeah you will have less of a chance to lose you money on trading, but by the reviews that i saw here, i think you will just enjoy these gains on etoros platform, and not in your bank account lol. Yes, agreed. This review on profitability of traders says nothing of the quality of service of any of the companies. However it does go some way to answering the often asked question of,“Do traders actually make money?” and gives definite numbers. Personally, I use one of the lower ranked companies, but I find their service is very good. Ultimately our trading systems and how we execute them are what will determine if we are profitable, regardless of the profitability of the groups of other traders. The FCA recently warned brokers not to try to go around the new regulations by using products similar to CFDs but following the old rules. Why do they even care if the UK will be exiting the EU? Because they will keep all the EU rules and regulations and only cancel the regs one by one if they see fit. This question does actually highlight the potential for the UK (or London) to flex its muscle as The / one of the most powerful financial centre/s of the world. It will be interesting to see if, after Brexit they decide to exit the ESMA regulations or downgrade them. The other issue to be watched is about the euro clearing centres… and how it relates to traders. I doubt us small retail guys will notice anything from that though.